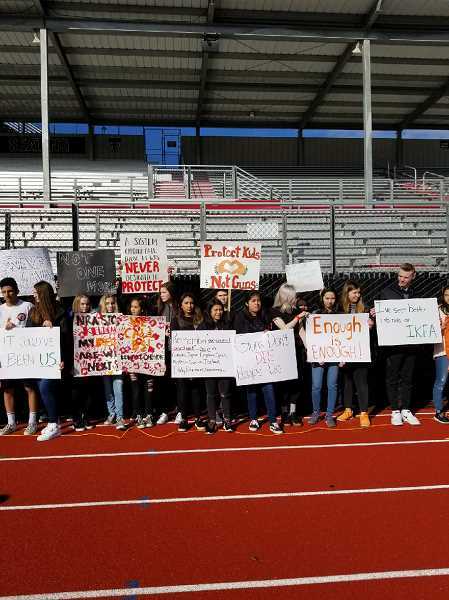 Throughout the community, the state and the nation, students held walkout protests for 17 minutes this morning to oppose gun violence. 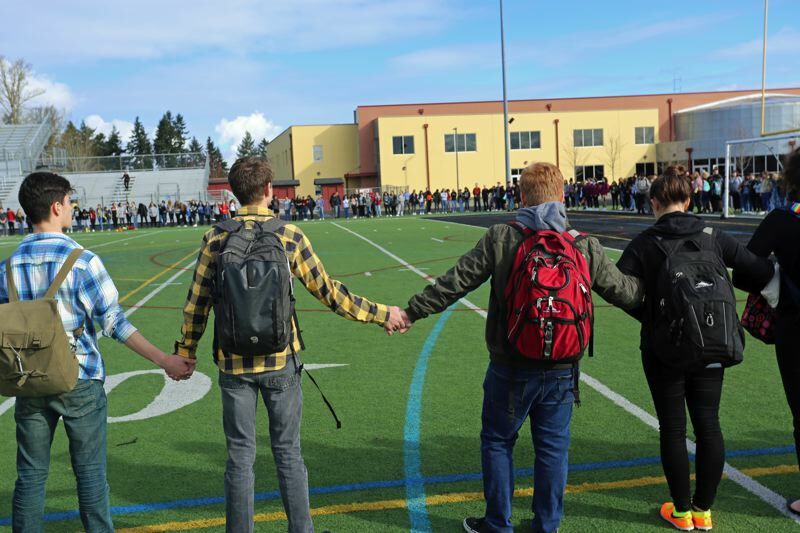 Students throughout the region, the state and the nation walked out of their schools today from 10 to 10:17 a.m. — a 17-minute tribute to the 14 students and three staff members killed in a mass shooting at Marjory Stoneman Douglas High School in Parkland, Fla., one month ago. 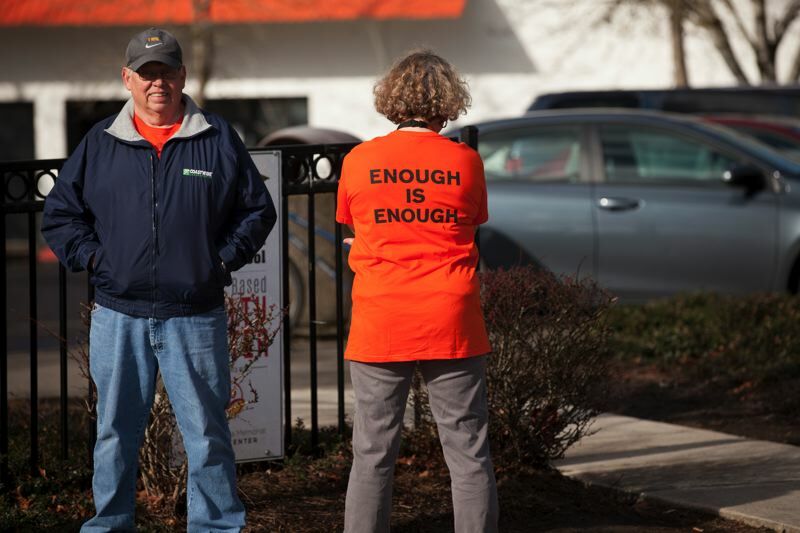 Terry Crawford, Beaverton High School alumnus of 1963, and his wife, Peggy, '64 alumna, went to Beaverton High to stand with the students. However, school policy forbade them from being on campus. "We were here to be with the kids when they come out to do their demonstration, and we're told we couldn't. We came to support the kids in the 17 minutes of silence," Terry Crawford said. "I feel very strongly about gun control and getting some legislation passed," he added. "I'm incensed with our Congress and the president seemed to be owned by the NRA. I want to see some strong legislation." 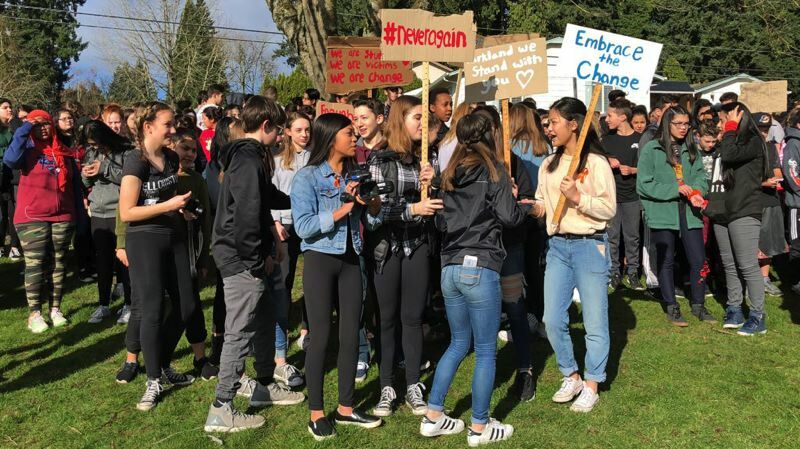 Moa Segerholt, a seventh-grader at Raleigh Hills Middle School in Beaverton, said the importance of the national walkout was to "spread the word" about gun violence in schools. Asked if she had a message for lawmakers, she said, "To do something! 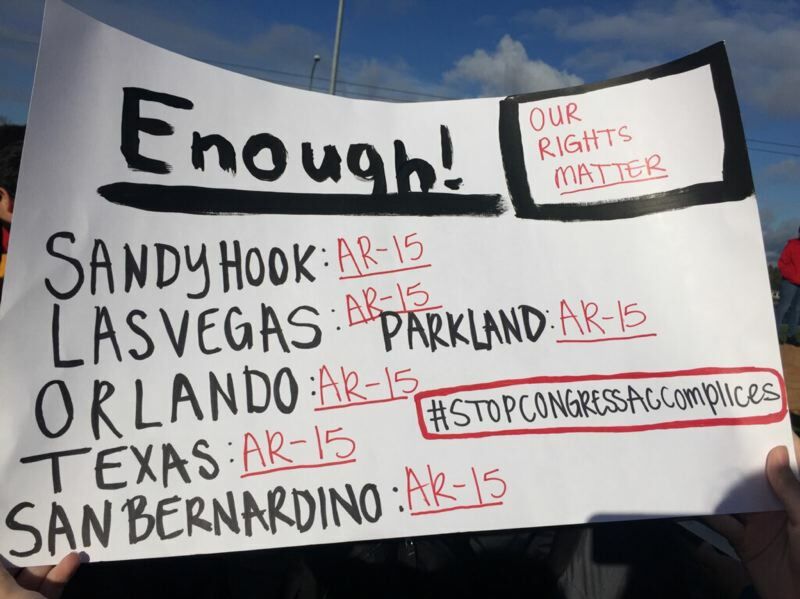 We as students know that gun violence in schools isn't right. As young as we are, we should be the one spreading the message." 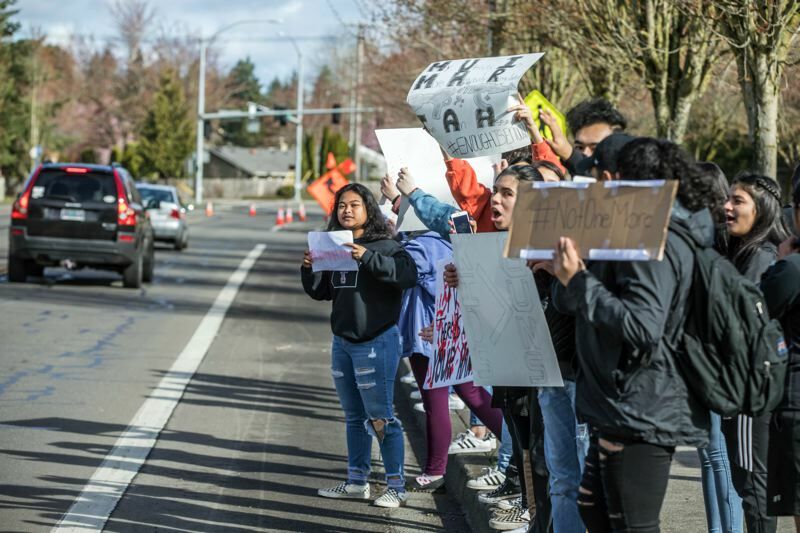 Parent Maricar Fernandez went to Twality Middle School in Beaverton to watch the protest, which included her daughter, Malia Fernandez. "Real proud of them organizing such a meaningful and peaceful walkout," she said of her daughter's classmates. 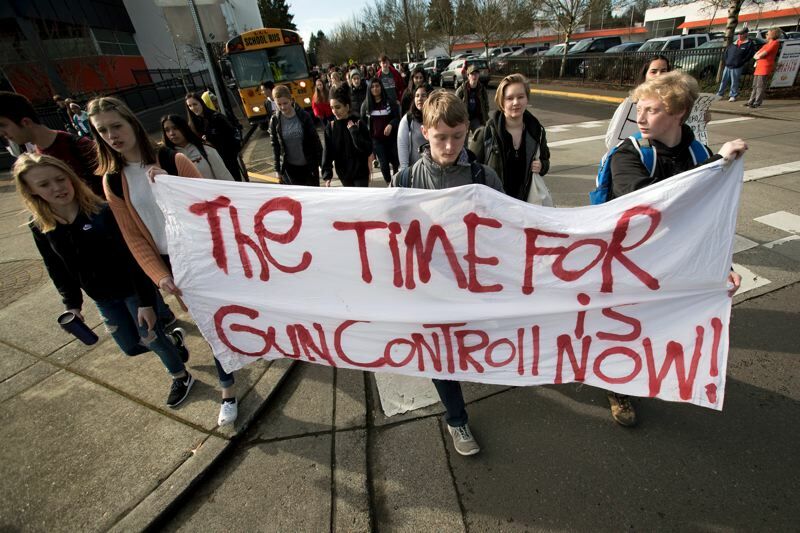 People protesting gun violence in schools, and inaction in Congress to stem such mass killings, also will march through Portland on Saturday, March 24. At Tualatin High School, Hadley Carlberg, one of the organizers of that school's walkout, read a short speech. "Seventeen people this time," she read. "Seventeen. The worst part is that I have to say 'this time' because there are so many cases I could list off, but there's no use because everyone has become numb to the numbers." Carlberg went on to say her mother shouldn't have to text her to "Be safe" while she's on her way to school. "That one hurt," she told students. "The fact that our government is unable to unite through a common goal can't be the reason more children are killed. This movement will hopefully give them the realization that we are the future, and that our lives deserve to be the goal that our nation unites around." Carlberg wrapped up by pointing out: "It can't stop until we can feel safe again in our own schools and feel that our lives matter enough to stop this madness. This isn't a one-sided political issue. Neither left nor right. I choose forward."